Administrators and broadcasters come and go, but there was something different about Wally Foreman. More than 3000 people filled a stadium in November, 2006, to farewell him after his passing from a heart attack, while his memorial service was broadcast on state-wide radio. It was the largest service of its kind in WA. Wally Foreman grew up in a small country town named Bruce Rock – a place he made famous through regaling the tales from The Rock. He was a career journalist and broadcaster, recognised by name, image and voice, and he fundamentally changed the Australian sporting landscape as the inaugural director of the WA Institute of Sport. Yet, he was far more than all of that. 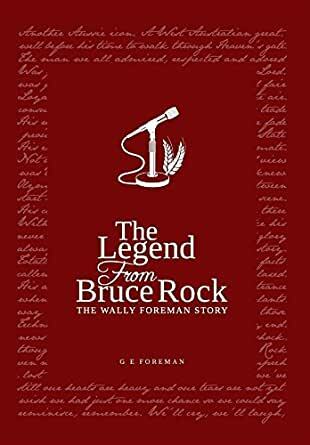 Written by his son to Charlotte, the grandaughter he never met, The Legend from Bruce Rock: The Wally Foreman Story details the remarkable, emotional and humorous life of a man who loved and impacted his home state, while always holding his home town in his heart. "Wally Foreman wore no masks - he invited the world into his life. Filled with the captivating and controversial tales of a wonderful man and told in a powerfully sincere way, this unique story reflects that character, inviting the reader into a life we all miss."